Sweden’s electric long-haul trucks are finally up and running — well, driving. 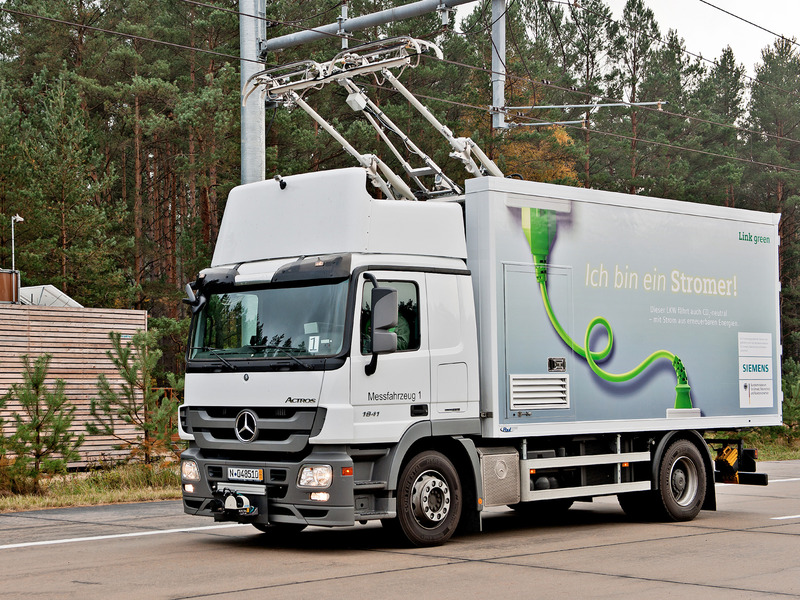 After several years of development with the global electronics manufacturer Siemens, Sweden has installed more than a mile of electric cables over the slow lane on one of its main highways. Though something of an eyesore, the lines are designed to give heavy traffic, such as long-haul trucks, an alternative to diesel fuel — a move that’s part of the country’s larger goal to be oil-free by 2020. Magnus Ernström, a project manager from the Gävleborg region, says a great deal of goods are transported along the mile-long patch of highway. “The railroad going the same direction is already full, so we see this as a flexible railroad,” Ernström tells the national radio station, Sverige Radio. A pilot study on that first mile is currently underway in the town of Sandviken. If it goes well (and the finances work out), Ernström expects to roll out the project on more than 120 miles of highway from the coastal city of Gävle to the industrial town of Borlänge. To some, the design may seem like a step backward. After all, Tesla has already figured out how to electrify a car via battery, without the need for messy cables. But massive trucks have different energy requirements than ordinary sedans. To power the weight of a long-haul truck and its cargo, a manufacturer would have to load the vehicle up with so many batteries that there would hardly be room left to transport anything. 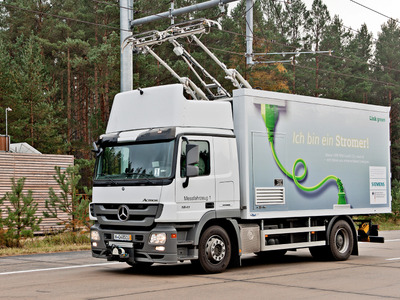 The only other way to eliminate combustion engines is to hook the trucks up to some sort of external power source. The technology bringing Sweden’s new plan to life, called a pantograph, is similar to the trolleys you might find in San Francisco. 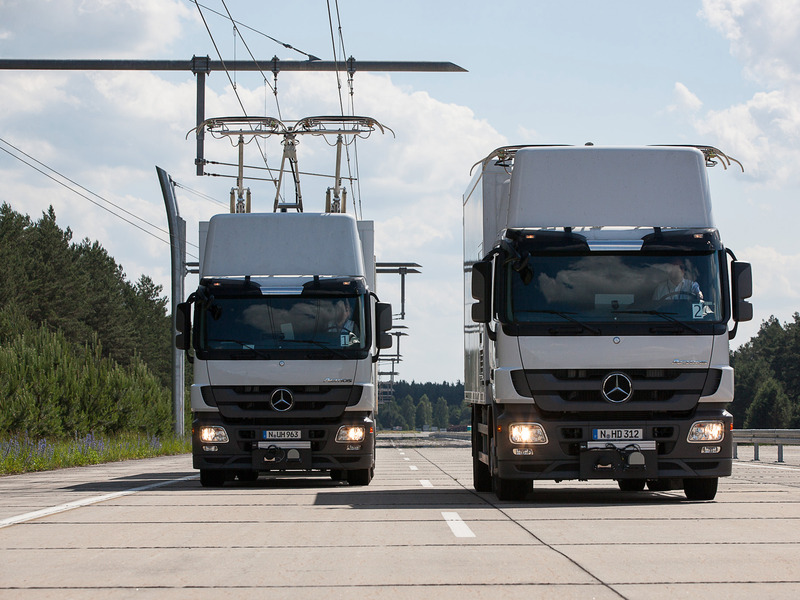 It involves dual sets of arms that extend up from the driver’s cabin to rest on top of the 17-foot-high cables, at which point electricity can flow from the cables into the vehicle’s drive system. 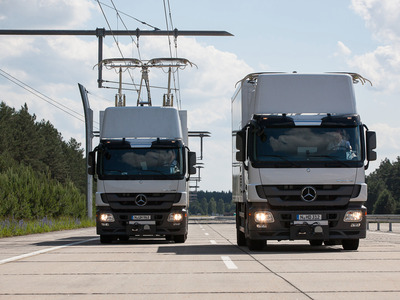 For the electrified lanes to work, all trucks must electric-diesel hybrids, since they still need an engine to drive on other roads. Ideally, electric car batteries will become small enough that engineers don’t have to sacrifice cargo space to make room for them in big trucks. But until then, Sweden will use miles of cables to forge a path into an oil-free future.